Adorable Sam and everything in that photo is colour co-ordinated. I am convinced that if there is any trouble it won't be Edie's fault.... lol. Quite a nervous day for you all. They won't let you down I am sure. Edie continues to leave little puddles as a welcome for my wife on her return from work. We are changing our situation though. My wife handed her notice in today and will be moving to a new job in 4 weeks time. She will work afternoons instead of the morning and I will come home for lunch so that Rosie and Edie will only have 4 days when they will be on their own and for only 1.5 hours. We think everyone will be better off with the new arrangements. I got home from work today, got out of the suit and into something more comfortable and got the girls out for a romp on the nearest beach, Havelet. Here's a few pics I took on my phone. I'm SO jealous of having a beautiful beach so close to home to take your pooches to. 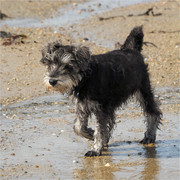 Yes we're planning to take Sasha (along with Oscar) to her first seaside trip post 30th Sept too, down to either Goring-By-Sea or Camber Sands. 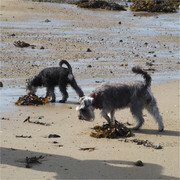 We'd a lovely sunny afternoon today so we took the dos down to Chouet beach for a run-around. Despite throwing up in her crate on the way ( and eating it again before I was able to pull over) Edie enjoyed her time with Rosie. I've had a look at Camber Sands on google earth and it looks beautiful. Rosie and Edie are in to their second week together in the morning. After realising that Edie couldn't (or won't) last the 4 hours, I picked up a large seed tray from a garden centre and lined it with some of the left over artificial grass. She picked up immediately what it's for She's always clean but has never yet been dry. I'm sure that it's only a matter of time and it will all come good as she (and her bladder) grows and matures. Edie was a real little biter when we first got her but is now less of a nibbler than Rosie was at the same age. I wonder whether it's because Rosie has been teaching her how much pressure she's allowed to use? One year ago today we picked Rosie up from a breeder near Blackpool and flew her back to Guernsey. She's proven to be wise beyond her years. I took Rosie and Edie out for a late morning walk around Saint's Bay earlier today. We walked on quiet roads and they had a romp on the beach. Edie seems to have settled in just fine with Rosie too. Thanks Leigh. They get on so well together it makes me wonder what all the concern was about on my part!